SewlutionExpert is a learning opportunity, designed to build a knowledge base that will result in a confident, more productive sales staff. Each certification path focuses on a specific area of expertise, and now includes: SergerExpert, QuiltingExpert, and EmbroideryExpert! Koala Sales and Sales Training A to Z videos are there as well to broaden your skills and expertise. View the required videos, pass the self-test, and earn 6 points for each! After all the self-tests in the Foundation Certification are passed, move on to the Final Quiz to wrap up your knowledge and earn 50 more points. 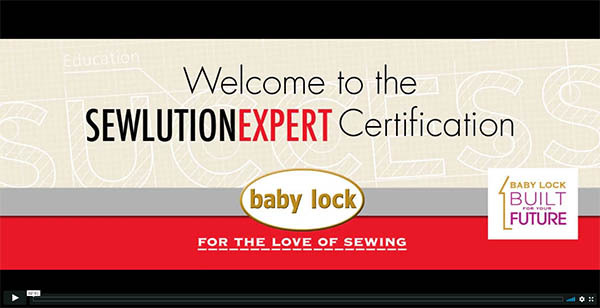 Now that the groundwork has been laid, Baby Lock is prepared to help you build upon it to earn Expert Certification. You can pick the way you will earn points as you achieve this level. View the required videos, pass the self-test and earn 6 points for each! Fill out the form that pops up, then click on the blue "Create account" button. You will receive an email when your account is approved! It's that simple to start learning all about Baby Lock machines and how to sell them. Visit our new LMS site to see all of our online course offerings. Sign up using the instructions above, and start earning points!